150 carriages – with the first entering service in mid-2017. These will operate between London Waterloo and Windsor & Eton Riverside. Requires platform extensions at ten stations. GreenSpeed Driver Advisory System collects real time data to calculate exact speed of train to improve punctuality. 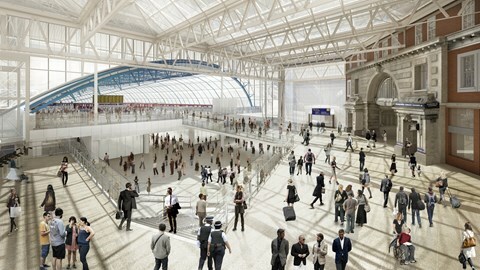 Construction work starts in the former Waterloo International Terminal, with minimal disruption to passengers using the station and no service alterations. Platform 20 reopens for passenger services. Weekend work, including some changes to weekend passenger services, to allow rail infrastructure to be installed. Platforms 1-4 extended at London Waterloo. Due to the track layout, this will mean Platforms 1-8 will be closed for 23 days. Network Rail will reopen platforms 20-24 to help maintain passenger services but there will be significant changes to services. Detailed information on changes to services during this period will be advertised in advance to ensure passengers understand how this will affect their journeys. Platforms 1-8 will reopen, with 21-24 closing to allow for the construction of the new passenger concourse and facilities.